40″ x 30″ (101 x 76cm) acrylic on canvas 2014. The latter began when Thurston Moore of Sonic Youth made a unique 60-second tape each for Chris, Yoko Ono, David Bowie and Gavin Turk, asking them to respond with a work of art inspired by it to be exhibited in ‘ROOT’ at the Chisenhale Gallery, London in 1998. Gollon was interviewed about this recently for a new biography of Thurston Moore, ‘We Sing A New Language’ by Nick Soulsby (Omnibus, 2017). Indeed, Gollon’s ability to paint a new language that reflects life as it really is made him unique. 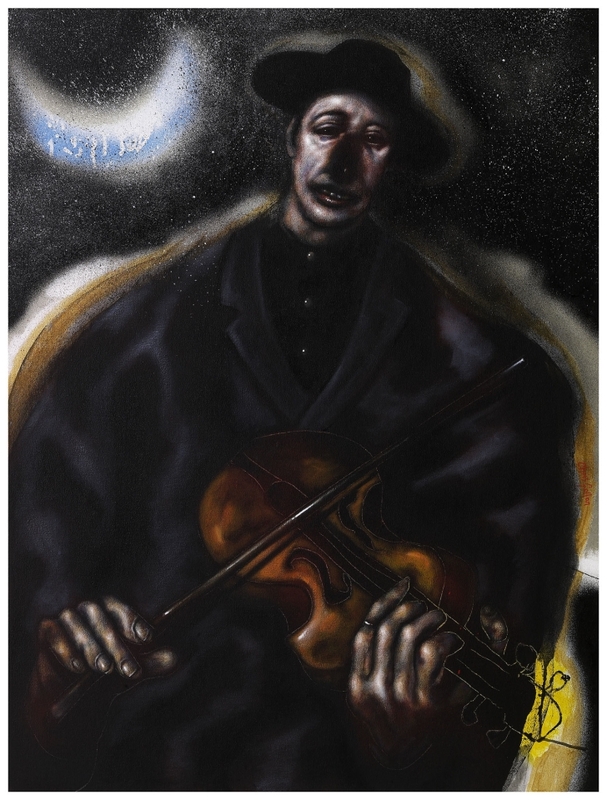 A friend of The Skids, he enjoyed the company of musicians, and one of his early museum acquisitions came when the Huddersfield Art Gallery acquired his large painting ‘Einstein & The Jealous Monk (after Bob Dylan’s Desolation Row) for its permanent collection to hang with Francis Bacon’s ‘Magdalene (II)’ and Sir Jacob Epstein’s ‘Einstein’. In 2013, he collaborated with Yi Yao, the Grammy-nominated Chinese classical musician to produce a 41ft-long painting and a 20-minute composition ‘And It Came To Pass’. His most recent ‘boundary crossing’ was NAKED MUSIC and ‘Gimme Some Wine’ (2014 -2017), when he enjoyed working with Irish singer-songwriter Eleanor McEvoy. Indeed NAKED MUSIC is now also a new book by Jackie Hayden (Hot Press, 2016) about their artistic interaction, with some fascinating interviews, songs and imagery. This exhibition shows Gollon’s ability to take us somewhere new, with imagery partially inspired by Neil Young’s ‘Driftin’ Back’, Bob Dylan’s ‘Man in the Long Black Coat’ and recently with Eleanor McEvoy ‘Gimme Some Wine’. This exhibition is kindly supported by Thomas Carroll Club Signature. (Pictured: ‘Man In The Long Black Coat’ 40″ x 30″ acrylic on canvas 2014 ).